from Angel’s Landing at Zion National Park in Utah. Sometimes there are no words necessary. Sometimes we can be drawn into a photograph and experience His glory. My husband snapped this photo as a California Condor circled above us and then landed just a few feet away, enabling us to take in his grand size and power. Being below the 12′ wingspan of a rare bird just above our heads was momentarily fear-inducing. The stunning beauty of Zion was majestic. The hike to the top of Angel’s Landing was breathtaking. Looking at beautiful photographs that hold treasured memories is valued. Despite the immense beauty of this glorious place on this planet He spoke to life, nothing can compare to what awaits us on the other side of eternity. Abraham, Daniel, David, Paul, Peter, John…they all knew it. You can know it, too. 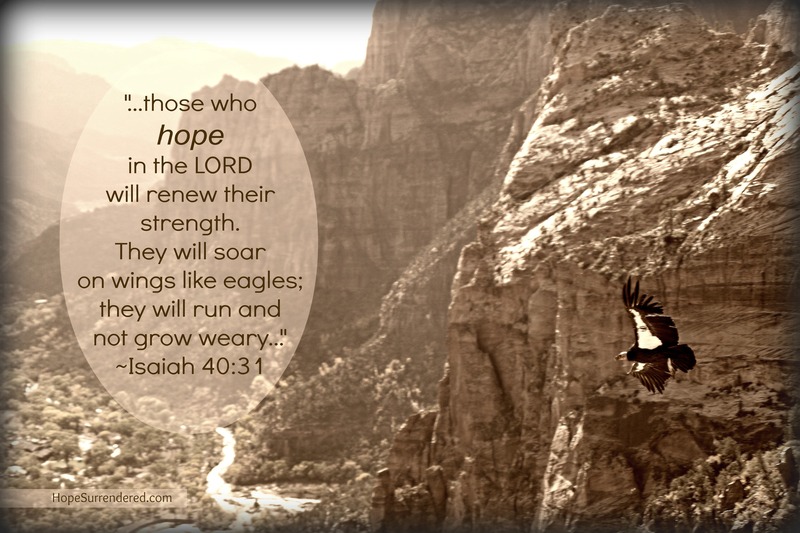 His Word… our hope can be renewed in it, our strength can be transformed by it, and our weariness can be eliminated by it. Feeling His hope and His strength does not come merely by reading His words.